Looking for great deals and discounts on hotels and resort cabins FOR FAMILIES...and GROUPS in Big Bear California? This is your one stop resource. Save Up To 25% Today Over Mountain Hotels! Make Travel Easy With our AAA Approved Travel Counselors. Big Bear's best full service resort offers comfortable cabins, inviting accommodations in a clean and pristine four season alpine environment at affordable rates. Big Bear's Golden Bear Cottages resort has the perfect accommodations to meet the needs of your next Southern California mountain vacation. Whether you're searching for a classy large cabin suite or an inexpensive cottage, Big Bear has it all (see the COTTAGES and PHOTOS buttons above). 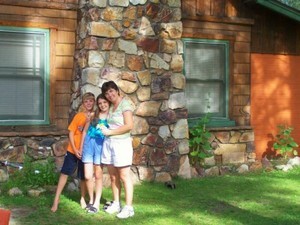 All of our cottages and cabins are close to the lake and the ski resorts. Be sure to ask about discount AAA, group and military family rates when you reserve your cabin in Big Bear over the phone at 1-800-461-1023 or reserve online in the Reservations box at the left. Come indulge and spoil yourself at our exceptional California mountain resort where leisure and relaxation await at Big Bear's family vacation rentals. For those looking for adventure, an array of recreational activities awaits in the naturally clean environment of the San Bernardino National Forest. Acitivities range from hiking, mountain biking, boating, swimming and fishing on our 3000 acre lake. Only a block from Golden Bear Cottages is Pleasure Point Marina with a large variety of pontoon and fishing boats that are very well maintained and clean. 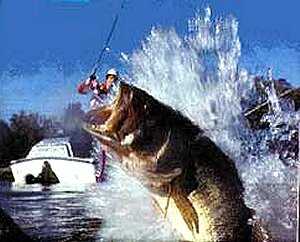 Cruise the lake, picnic with the family, or drop a line and reel in the big one! Pets welcome too! 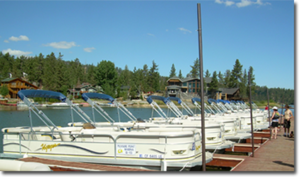 Affordable cabins and cottages of all sizes are available using our online booking reservation system offering some of the best lodging and boat rental prices in COOLEST PLACE IN SOUTHERN CALIFORNIA, Big Bear Lake. We are bilingual at Golden Bear Cottages, best places to stay in Big Bear. Big Bear resort cabins at Golden Bear Cottages Resort resemble story-book cottages that are perfect for couples, small, medium and large size families. These resort cabin lodging properties are easily identifiable as a group of free-standing rental units at 39367 Big Bear Blvd. in Big Bear Lake. Golden Bear Cottages can easily be recognized as its own quaint village. Come, bring your family and enjoy our outdoor spa, heated pool and recreation area. Our Cabins are equipped with flat screen TV's, fireplaces, kitchens, wireless internet and half of them have indoor Jacuzzi' or spas. The cabins and cottages range in size from studios to seven bedroom retreats. Our Big Bear cabins have a fun outdoor recreation area with various games, and at the heated pool and spa we have family movie nights and other amusement to suit kids of all ages! 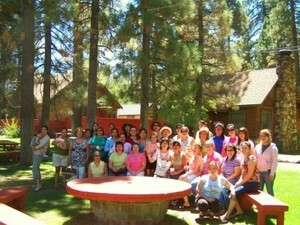 Golden Bear Cottages is one of the best places to stay for both groups and families in Big Bear Lake, California. The beautiful mountain vistas in and around Big Bear Lake are just a short drive from Ventura, Los Angeles, Orange County, San Diego and Las Vegas. Big Bear Lake is the perfect place for rustic weddings too. Best place to stay: AAA approved cabins. Ranked as the best Southern California mountain vacation spot, and Orange County Register's best rustic themed place to stay. 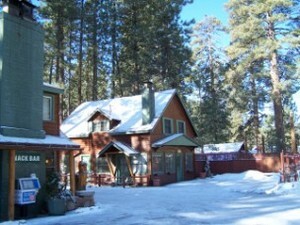 THE BEST PLACE TO STAY IN COOL Big Bear Lake eagerly awaits your arrival. Best family vacations in Southern California are at Golden Bear Cottages Resort. Best Family Cabins, California, 2009-2016 rated the best place to stay in Big Bear Lake. Ranked as the best Southern California mountain vacation spot, and Orange County Register's best rustic themed place to stay. THE BEST PLACE TO STAY IN COOL Big Bear Lake California, in the heart of the National Forest, eagerly awaits your arrival. "AAA approved cabins"-"cabañas aprobado de AAA"
1. How long has the business been operating and how did it start? Golden Bear Cottages was originally opened as a full resort lodge in 1927. It has been continually operating since then. The cabin construction was started in 1915. Over the years it has become a historic landmark in Big Bear Lake. Don and Karen DiCarlo and Lisa and Len Duran are only the fifth private family to own this property in over 90 years (purchased by our family in 1999). These historic resort cabins at our AAA approved lodging property are easily identifiable as a group of free-standing rental cabins at 39367 Big Bear Blvd. in Big Bear Lake. Golden Bear Cottages can easily be recognized as its own quaint mountain village of one to seven bedroom cabin accommodations. Bring your family or group and enjoy the outdoor spa, heated pool and unique non-hotel outdoor recreation areas. 2. What is this company's mission? Golden Bear Cottages family owned resort staff considers it a great honor to carry on the role of protecting and sharing the beauty of the California historic big pine forests with their guests. Their goal is to nurture an environment in harmony with the nature and history of the mountain while allowing our guests to enjoy a relaxing Big Bear Lake alpine experience. They strive to make our resort an antidote to all that is excessive, formal, artificial or contrived. By focusing on the very essence of life, they hope to offer relaxed family and group lodging guests a welcome non hotel retreat experience in tune with the spirit of the mountains in Big Bear Lake. 3. What does this company specialize in? Individual family and group accommodations. They are very proud of the fact that over 60% of their business are a returning guests or referrals. Golden Bear Cottages Resort resemble story-book mountain cabins and cottages that are perfect for couples, and also for small, medium and large size families. Golden Bear Cottages is also the perfect mountain setting for group retreats and reunions. As a Christian family resort they specialize in men's and women's group retreats, Bible study retreats, youth retreats, college retreats, sports team travel accommodations, family reunions and business team building retreats and conferences. 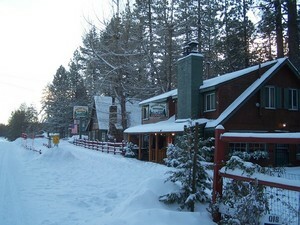 Golden Bear Cottages is the only lodging resort in the Big Bear Lake area to offer Tempur-Pedic queen beds. 4. Who is the founder or owner of the company and describe his/her past activities? The owners of Golden Bear Cottages Resort are all local Southern California residents. The family has always been entrepreneurs and have previously owned many other retail, shopping center and sports related business in Southern California. 5. What is this travel company's most popular travel package and why? Weekday AAA approved family vacations come with ski tickets or boating coupons during each season. 6. 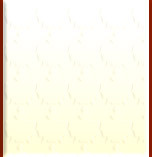 What are the exclusive offers from this lodging company?